Here’s you’re inside look at one of the pages! This is a photograph of a journal that I found in the Outdoor Environmental Club house on campus. 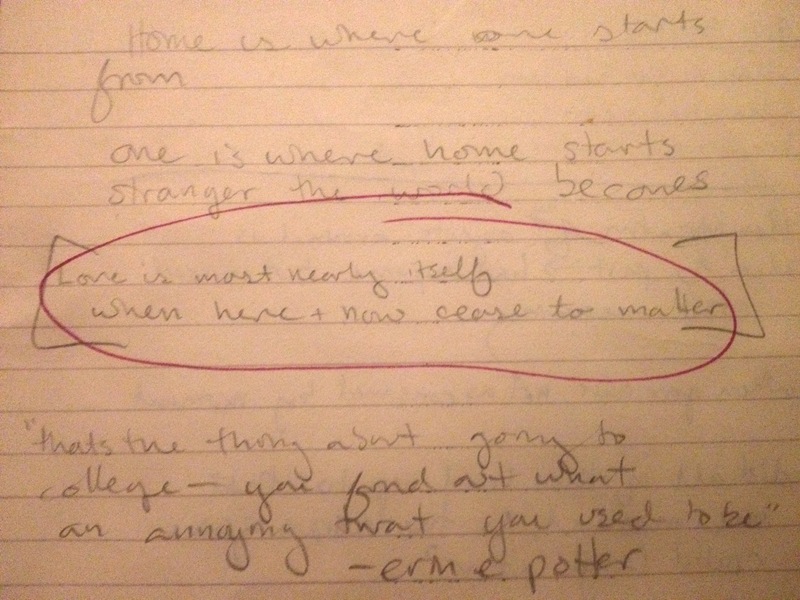 The girl writing in the journal went to Beloit in 2006 and was very concerned with her relationships to a few Beloit guys, her creative writing assignments, and T.S. Eliot. A lot of people seem confused what a zine it. Basically it can be anything you want it to be, within the realm of your own self-publishing abilities. I chose to make my zine themed around a question and to enlist the help of my friends and fellow Beloiters in answering it. How does love sound? There isn’t a right answer but there are many honest ones and that’s what I got. People (all women!) sent in poems, songs, photos, and even some iPhone autocorrect notes. I weaved in a few of my own drawings, and boom. There was a zine! My second favorite part after the first printing has been watching people pick up the zine and flip through it. Please ask me for a copy of the zine if you would like one. I will mail them anywhere you’d like. It may not be online, but for the next few weeks I have as much free printing as I want, courtesy of Beloit College!